Please join us for this two-part lunch series featuring Professors Richard Epstein, Laurence A. Tisch Professor of Law, and Jeremy Waldron, University Professor, NYU School of Law. Professors Epstein and Waldron will be focusing each of the two sessions on a classic philosopher, Friedrich A. von Hayek and H. L. A. Hart. 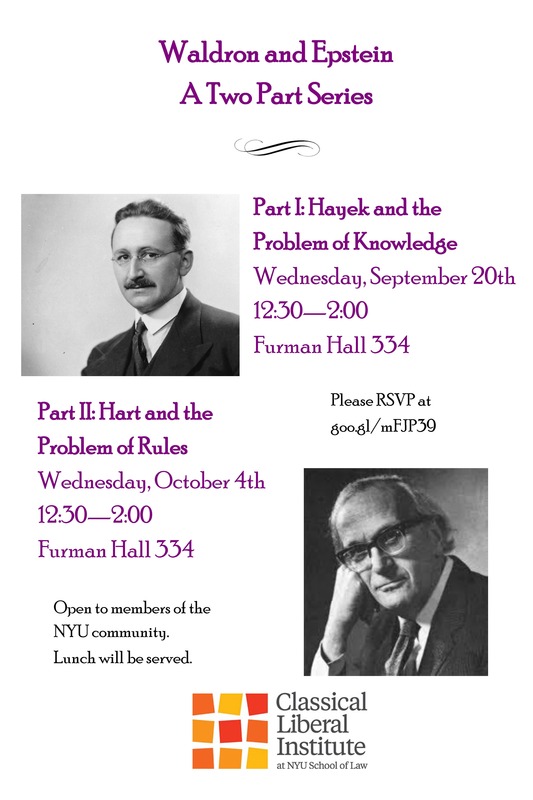 Part I will focus on Friedrich A. von Hayek. Discussion will be based on the Road to Serfdom (1944), Chapters Six (Planning and the Rule of Law) and Chapter 9 (Security and Freedom) . A copy of the text will be circulated to attendees in advance of the sessions, as well as additional readings selected by Professors Epstein and Waldron.